Adidas has announced a new performance running shoe line called Futurecraft 3D, which will offer consumers a custom-formed and 3D-printed midsole. The midsole can be tailored to the shape and the cushioning needs of an individual's foot. Linked with existing data sourcing and foot-scan technologies, it opens unique opportunities for immediate in-store fittings, Adidas said in a statement. "Imagine walking into an Adidas store, running briefly on a treadmill and instantly getting a 3D-printed running shoe - this is the ambition of the Adidas 3D-printed midsole," the company said. The Futurecraft 3D running shoe prototype. 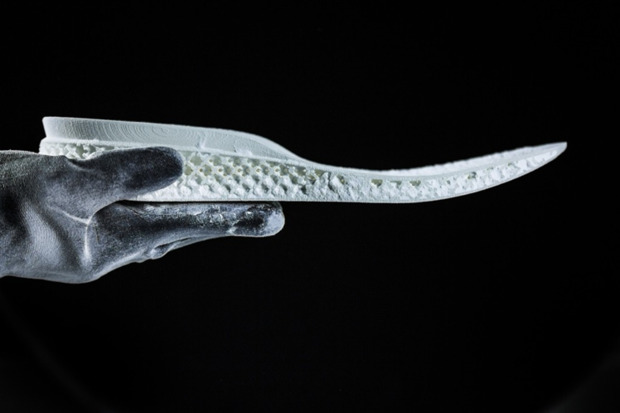 Adidas said with 3D printing using CAD software, it can create a flexible, fully breathable carbon copy of the a runner's footprint, matching exact contours and pressure points. The midsole with be printed using a modified thermoplastic polyurethane (TPU). "It's brand-new in the marketplace and convinced us with its durable elasticity as well as high tear strength and abrasion resistance," Adidas's footwear development manager, Daniel Cocking, wrote in a blog post today. 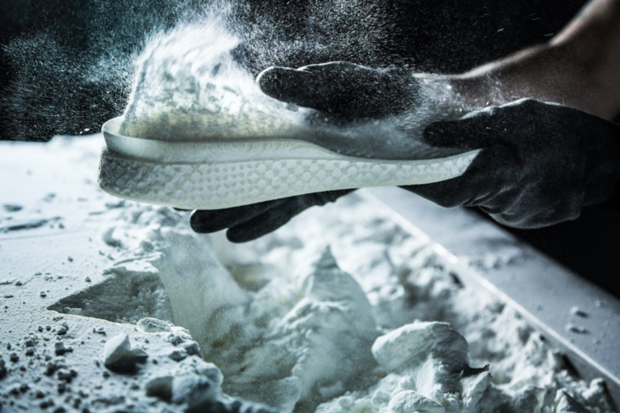 Adidas is partnering with Materialise, a 3D printing service provider that will be creating the midsoles for the sports equipment company. Cocking did not mention when the company will begin offering the custom-printed midsole. Materialise will use a 3D printing process called Laser Sintering, which uses a light beam to melt together powdered material on a print bed layer by layer. A midsole being removed from a bed of powdered polymer after being formed through a 3D printing process called Laser Sintering. Cocking said since 3D printing is so fast in prototyping stages, within 2 weeks "I had run in the shoe myself." But there were other hurdles, he added. "We found that stiffness of the midsole varied significantly as a result of very minor process or design changes," Cocking stated. "We began a thorough investigation into the process parameters required to achieve the perfect cushioning." Adidas involved 15 of its development teams, adding a complex range of test methods and technical support that Cocking said created the world's first running shoe that is "impossible to create in any other way."